Act! is the #1 best selling Contact & Customer Manager, trusted by businesses, sales teams & individuals to get organized and take the guesswork out of marketing to drive sales results. Click here for a detailed view of the Act! product range and our expert Act! consultancy services, this will take you to our ActSoftwareConsultants website. Act! v21 is Windows 10 compatible. 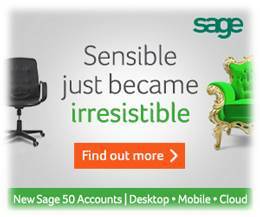 From invoicing customers and paying suppliers, to dealing with every aspect of your VAT and accounts, Sage 50 Accounts helps you manage all the different areas of your business. It gives you the reliable information you need to stay in control and drive your business success. We are Sage Business Partners, contact us for Sage Software and Sage Services. Act! Marketing Automation makes it simple to optimise all the ways you communicate with prospects and customers to maximise engagement and drive business growth - exclusive to the Act! Growth Suite! We are an accredited Act! Training Partner. Act! Pro is suitable for 1 - 5 users on-premise CRM solutions. Act! Premium is suitable for 1 - 100 users on-premise CRM solutions, access via your LAN or via the Web. Act! Premium Cloud for users that require access via the web and do not have an on premise server. PRINCE2 accredited Project Manager resource available on an interim basis. Create quotes in Act! - comprehensive product lists & muti-currency options learn more: Seamless Opportunities.